My water lab allows us to become a scientists and experiment with water. Prefect for a summer holiday outdoor activity and pretty good the rest of the time too, even for a school setting. This lab can combine lots of different activities where you can move from station to station pick spend time at what interests them most. 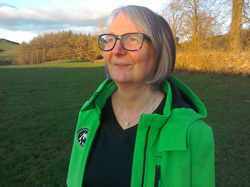 I designed the laboratory to allow a wide spectrum of ages to be accommodated at the same time. 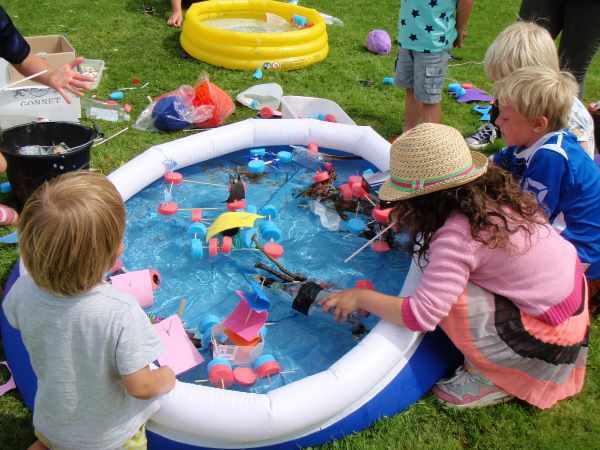 Alternatively we can focus in on the activities exploring one or more aspects of water and spend time really exploring this within a specific age range. 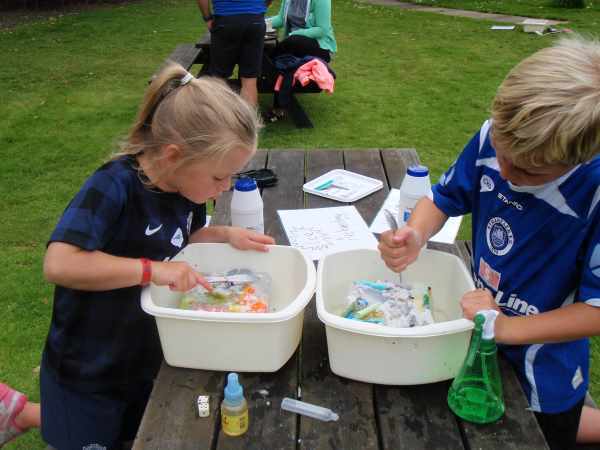 You can always add some pond dipping or rockpooling and look at the ecology of the animals living in water too. Looking After Our Environment - most of the things that I use in this lab have been used before. 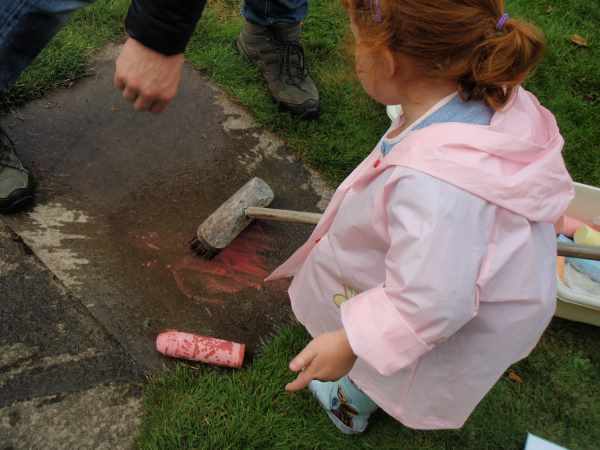 I have found most of the toys which sink or float, or are dug out in the ice archaeology items at car boot sales. I keep the foam bits and pieces from this and other activities even when they are cut up we can still use them again, they started off being rockets some time ago. Investigating Water - Pouring, splashing, filling, emptying, trickling, squeezing, spraying, dripping, carrying, measuring, listening, looking, feeling, thinking, discussing about water and so much more. There is always the water cycle too learning about evaporation, condensation and precipitation. 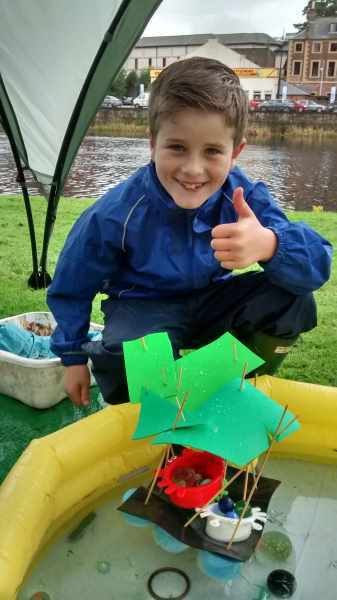 Experiment with Water Density - This appeals to all age groups as there are layers of experimentation. 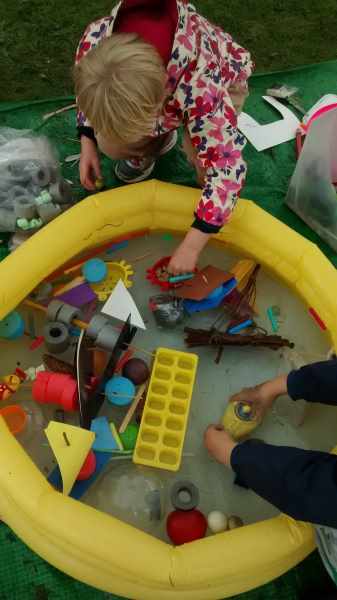 You can simply find out what sinks and floats to the challenge of making things that float sink and making things that sink float. 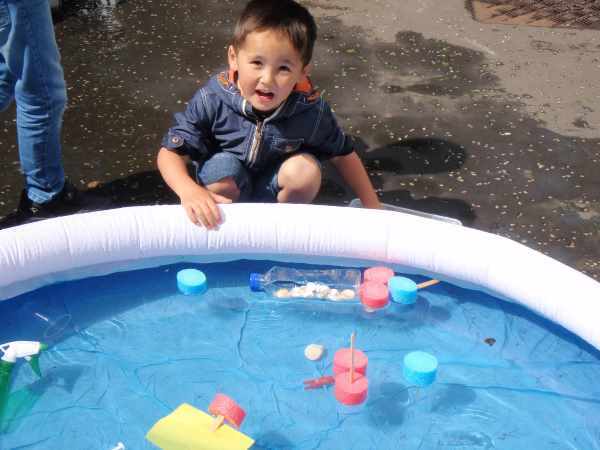 This activity leads on nicely to the next one - making boats and other creations that can sail across the paddling pools. 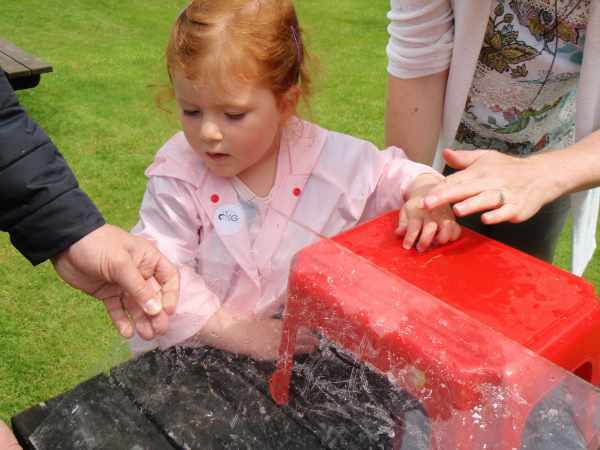 Discover sounds in Water - Sound changes in water and the sound that things make change when you add water to them. I have lots of different things that can make sounds, experiment with them and see what music you can make. We can even make a bottle and water xylophone to play a tune. 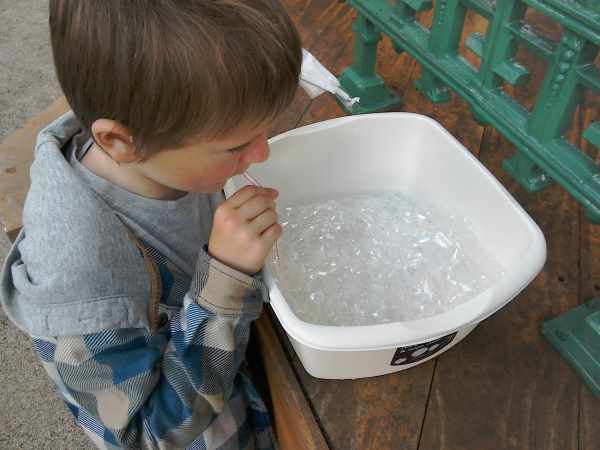 Excavating Ice Archaeology - What a great activity for a lovely hot summer's day. I have some other great ice activities for if it is below freezing too but let me tell you about this one. Even I was amazed how long this absorbs children's attention. Given a large block of ice with toys embedded in it they spend lots of time scraping, melting and generally persevering as they dig their chosen object out. I provide the tools - sprays, scrapers and salt to try out and you can decide what works best to excavate your finds. Everyone keeps coming back to it again and again to see if they can excavate anything new. Slippery Ice Slides - It is amazing to do practical experiments see that different shapes and sizes of ice travel down slopes differently. Altering the angle of the slope makes everything behave differently too. 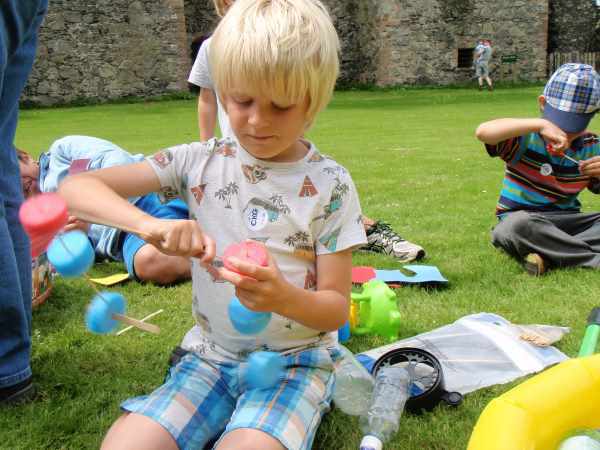 You can test out hypotheses, have races, try out shapes and discuss friction or just have fun. Creating Water Colours - Hot and cold water, salt and fresh water, you can see how these interact if you make them different colours. You can add other liquids too Which floats on the others? I love putting colour into ice and seeing what happens as it melts. You can use coloured ice to paint on paper and pavements or see how water temperature makes water move using coloured ice. If you want I can show you some real water colour painting tecniques too. 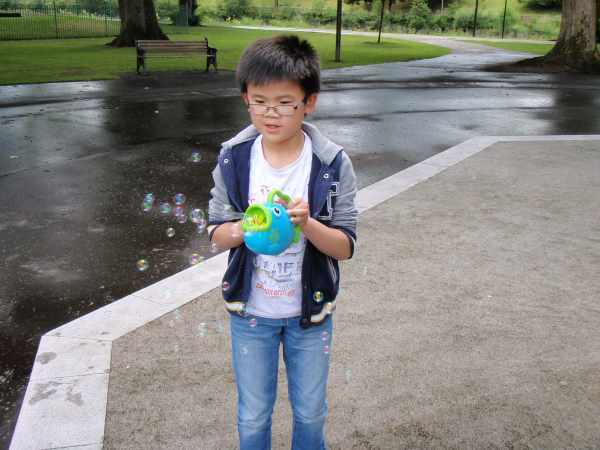 Blowing Bubbles, or How Does Soap Affect Water? - This is a whole new laboratory on its own but I usually add a few bubbles to my water lab too, mostly because I like them. 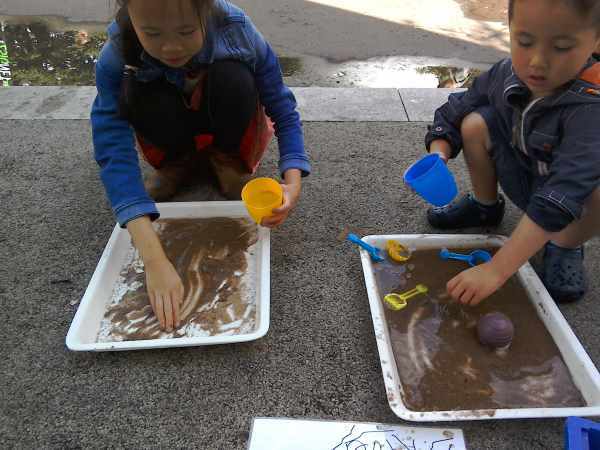 ​Discovering your own River - Given a tray of soil or sand, some peddles or stones and something to pour water you can make rivers and seas, it is a great way to see how water affects different substrates and how they affect water too.